Amplification is the process of increasing the amplitude of a AC signal current or voltage such as audio signal for sound or video signal for a television picture. The amplifier allows a small input signal to control a larger amount of power in the output circuit. The output signal is a copy of the original input signal but has higher amplitude. Amplification is necessary as in most applications, the signal is too weak to be used directly. For example, an audio output of 1mV from a microphone is not able to drive a loud speaker which requires a few volts to operate. Hence, the signal need to be amplified to a few volts before it can be fed into the loud speaker. An example of different type of transistor configurations in the circuit is as shown in Figure 1 below. The common emitter(CE) circuit uses emitter as its common electrode. The input signal is applied to the base and the amplified output is taken from the collector. This is the one generally use because it has the best combination of current gain and voltage gain. The common base (CB) circuit uses base as its common electrode. The input signal is applied to the emitter and the amplified output is taken from the collector. The relatively high emitter current compared to the base current results in very low input impedance value. For this reason, the CB circuit is seldom used. The common collector (CC) circuit uses collector as its common electrode. The input signal is applied to the base and the amplified output is taken from the emitter. This circuit is also called an emitter follower. This name means that the output signal voltage at the emitter follows the input signal at the base with the same phase but less amplitude. The voltage gain is less than 1 and is usually used for impedance matching. It has high input at the base as a load for the preceding circuit and low output impedance at the emitter as a signal source for the next circuit. They can be classified into classes A, B, C and AB. They are defined based on the percent of the cycle of input signal that is able to produce output current. In Class C, the output current flows for less than one half of the input cycle. Typical operation is 120 degree of input current during the positive half cycle of the input current. This class has an efficiency of 80% but has the highest distortion. This class is usually used for RF amplification with a tuned circuit in the output. In Class B, the output current flows for one half of the input cycle which is around 180 degree. Class B operation lies between class A and class C. Class B are usually connected in pairs and in such a circuit called push-pull amplifier. The push-pull is often used for audio power output to a loud speaker. In Class AB, it offers a compromise between the low distortion of class A and the higher power of class B. It is usually used for push-pull audio power amplifiers. 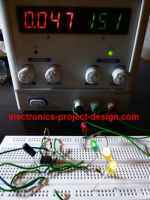 This is a 25 watt audio amplifier module project using LM1875 IC module from National Semiconductor.